Get Your Workspace into the fast lane! PitStop race-inspired furniture provides a unique way for race fans to maneuver the workday racetrack with ease. The PitStop GT Complete Office Furniture Set is the perfect way to transform your mundane office into a race fan�s dream. Sleek and thoughtful designs coupled with stylish race-inspired details ensure a workspace with head-turning good looks and turbo-charged functionality. 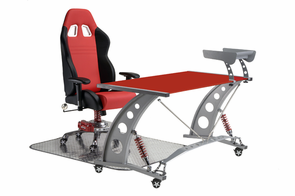 With the PitStop GT Complete Office Furniture Set, you�ll find yourself racing to meet any task! Choose your chair and color in the drop-down menu in the order box.